Discussion in 'JK Handmade Knives' started by JK Knives, Mar 3, 2019. 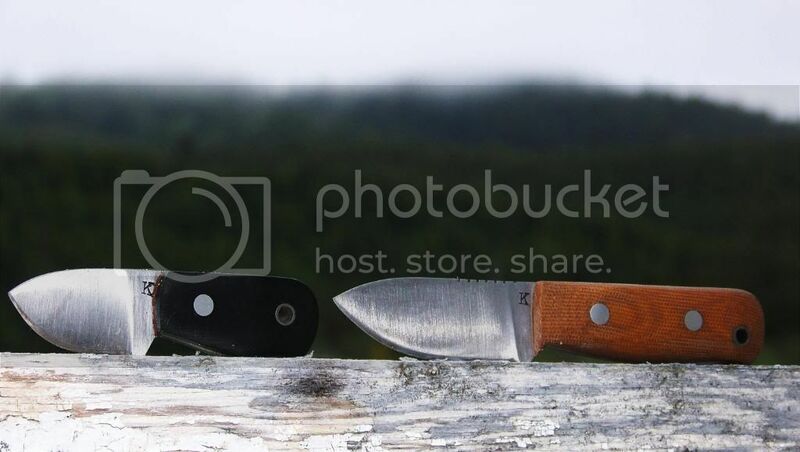 I`m planning a run of Tin Knives in May, if anyone is interested. These are just under 4" OAL, 1 5/8" cutting edge, 1/8" thick O1 steel,, and will go for $53 shipped. Rupestris, Nature Boy, fishiker and 4 others like this. I could use one! Are you doing any sheaths at all? I could also do these with 1/8” thick micarta handles and kydex pocket sheath for $83 shipped, the perfect pocket fixed blade. For sure I'll take one! Do you have any pics of one with scales? I'm having a tough time imagining that (but I bet it's cool!). All my old pictures have disappeared. Out of the blue the stars aligned correctly and I have a few days off! I'm heading to Idaho to meet up with a buddy and maybe get a quick camping trip in. When I get home I'll shoot you and email, John. Definitely I'm in for a Tin Knife, just need to decide the specifics. I have one with scales. I'll take a pic in the morning after I get off work. I think that mine was the first tin Knife you made with scales. I may be wrong of course. That is my oldest and my EWOK is slightly younger. I'll take one with scales and a sheath. John please sign me up for one of these. Thanks. Let me know what color micarta, thanks! John, what colors do you have on hand? I like the red you used for my Camp Knife but I'd be interested in other colors as well. I don’t carry anything in stock, but offer black, tan, or green standard. The red would be $10 extra.